Meetings are generally held during the school year (September-May) in the Memorial Hall Youth room from 6:00 – 8:00pm. Be sure to check the calendar for special events, fund raisers, lock-ins and holiday parties.The Youth have their own special room to hang out in with comfy couches, bean bags and lots of snacks! 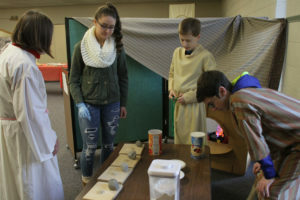 Outside of their regular Trinity meetings, the Trinity Youth Group also volunteers in variety of activities during the year such as volunteering with City of Newark Clean Up Days, planning and leading a Youth Sunday worship service, writing holiday cards to home bound church members, and many other special projects.